Some things — like Peyton Manning calling out 'Omaha' at the line of scrimmage — survive even when coaches change. Peyton Manning bid farewell to a record-setting offensive playbook this offseason when the Denver Broncos changed coaches and offensive coordinators. He’s finding it tougher to do the same with his favorite geographical pre-snap phrase. The star quarterback was heard screaming "Omaha" before plenty of plays in Sunday’s regular-season opener against the visiting Baltimore Ravens. Some resulted in handoffs. Most ended up with Manning throwing the ball. That doesn’t necessarily mean Manning changed the play calls, though. He could just be using his old slogan to catch the Ravens off-guard. Or, as his brother intimated in an interview last offseason, the "Omaha" call could be used to help offensive linemen with the snap count. More likely? 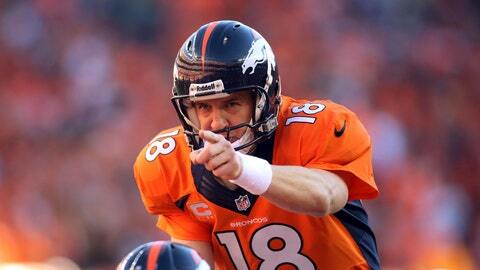 Manning is a renowned control freak — and old habits die hard for 18-year veterans.